Austin is a cool city. It has a party-vibe to it similar to Las Vegas, but with a hippie vibe like Portland. Everyone says it’s the Portland of Texas. I get it. It’s a fun city, it’s healthy and into fitness. I saw so many cyclists and an incredible number of runners in the city–which impressed me! How the hell do they run when it’s 100 degrees out? The other thing about Texas is that everyone is so friendly. 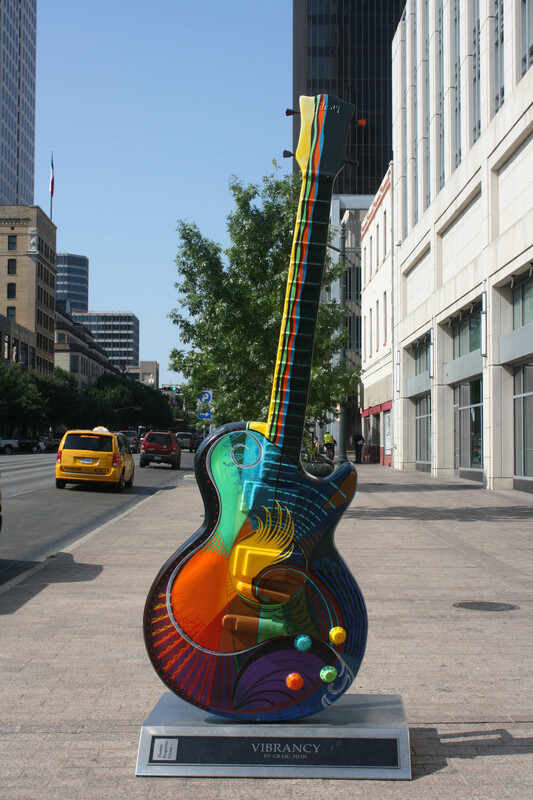 Austin is just a nice place to visit. I left off my story with me melting in the heat after a hike and stroll through the park. We just wanted to kill some time and relax out of the heat. It was nearly intolerable. 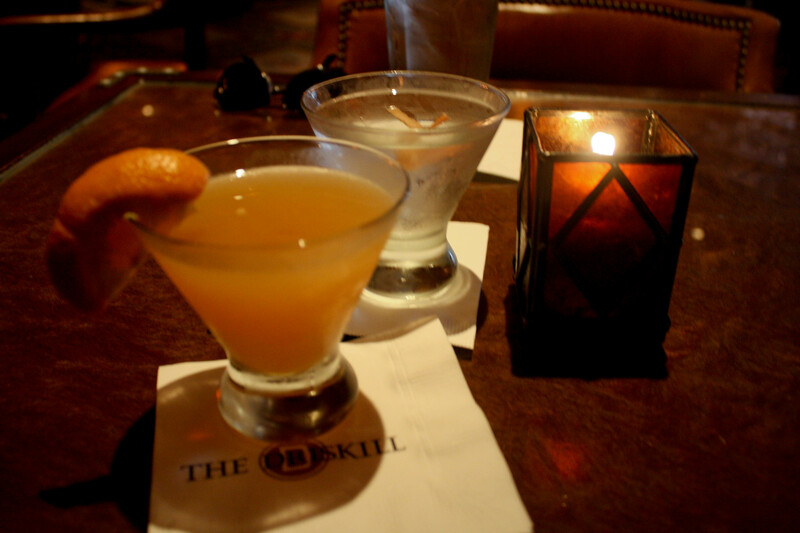 We ended up once again at The Driskill. We both loved the opulence of the historic hotel and the amazing air-conditioning. Their bar was classy, comfortable and the service was top-notch. No wonder it was a favorite. Michael and I had a leisurely drink (he had a Martini and I had a Texas Orange blossom which tasted like the orange and vanilla ice cream cup) and then we made our way to dinner. It was happy hour, thankfully, so our drinks were half price. 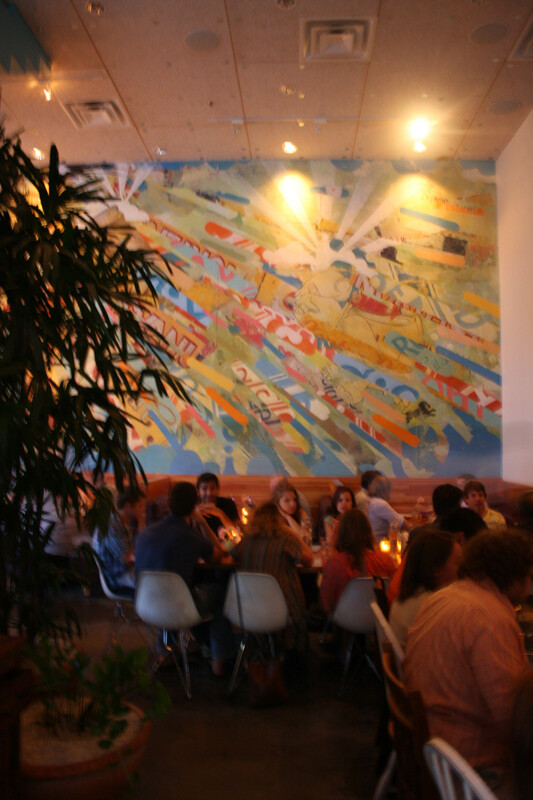 Dinner was at La Condesa. Mexican was a must. The place was cool and trendy—definitely upscale. The place was packed when we got there but luckily got a table outside. The restaurant reminded me of a yuppie Portland NW 23rd joint. I got a glass of the tempranillo and Michael got a Shiner. 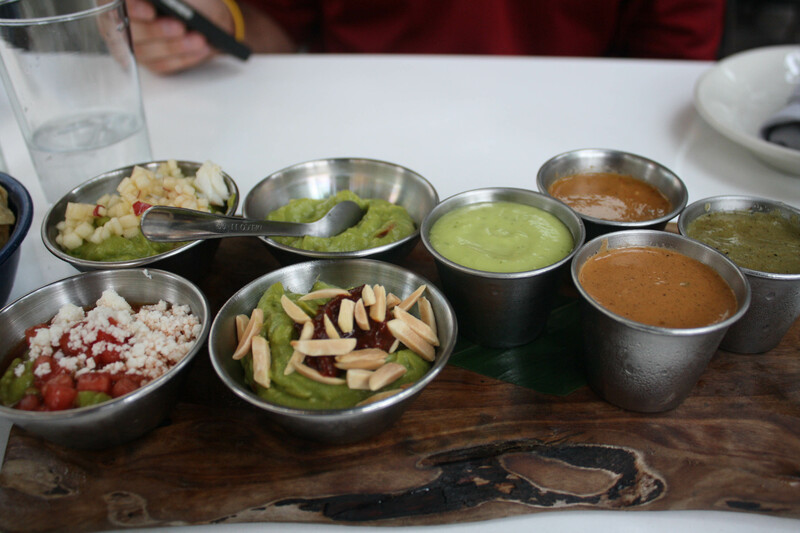 For dinner we ordered the “Guacamole Flight.” If you go to La Condesa, the guacamole tasting is a MUST. It’s unique and you won’t be disappointed. It also came with four salsa samplers. There were 4 guacamole samples. 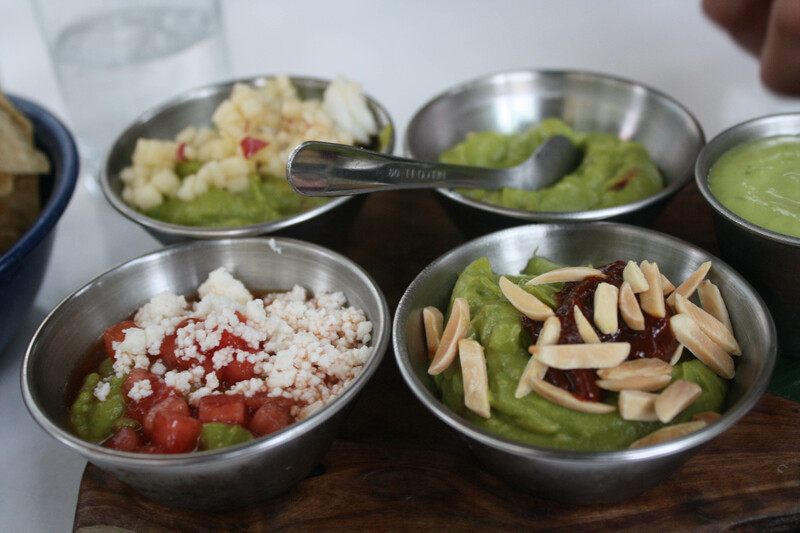 The first was their plain, original guacamole. Next was one with chipotle jam and sliced almonds on top. Odd, but totally fantastic—smoky and delicious. Next was guacamole with diced apples and crab! Who knew that avocado, crab and apples would be a good combination? Finally, there was one with chunks of watermelon and cojita cheese crumbled on top. Bizarre but fantastic and it was Michael’s favorite. 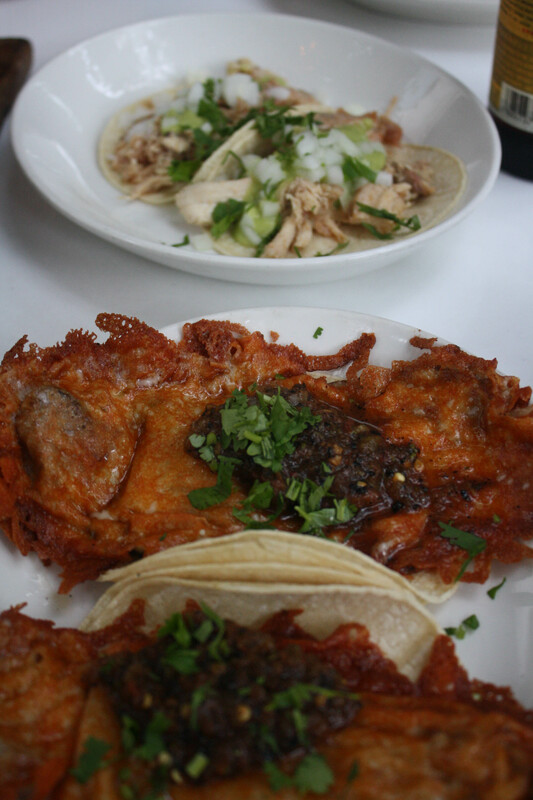 For the entrees Michael got chicken tacos and I got the El Califa—wagyu beef and cheese—tacos. There were two of each and we shared. I felt like the El Califa taco was okay but the cheese definitely overpowered the beef. The chicken was mild and tasty. I was also glad that the portions were small because I was honestly sick of eating! 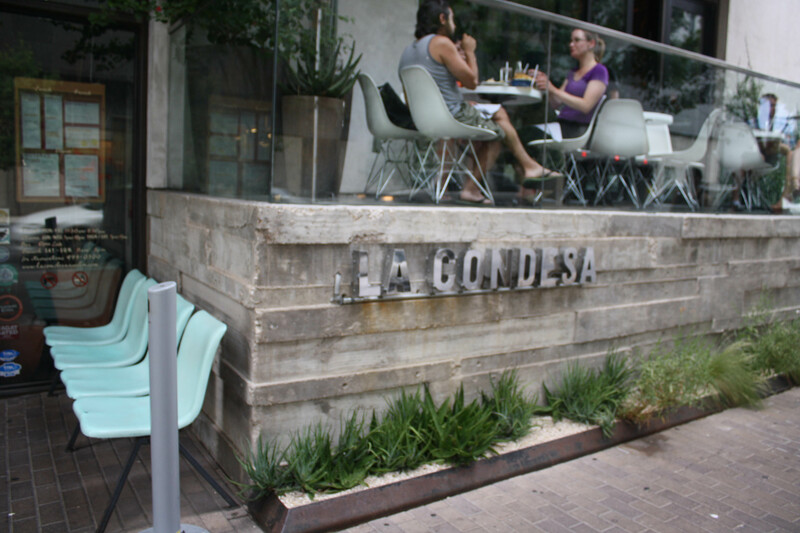 La Condesa was cool and worth a visit, even if you just go for a snack and try the guacamole. It was a little on the spendy side, though. We finished up our evening at The Ginger Bread Man pub. I got a half pint of the Live Oak Liberation IPA—a Texas beer that the waiter at The Driskill recommended we try. It was delicious and just like a Portland beer! Tasty! I was glad I had a half pint because I’d reached my limit of food, alcohol and indulging. The Ginger Bread Man was a cool pub (reminded us of The Horse Brass English pub in Portland). 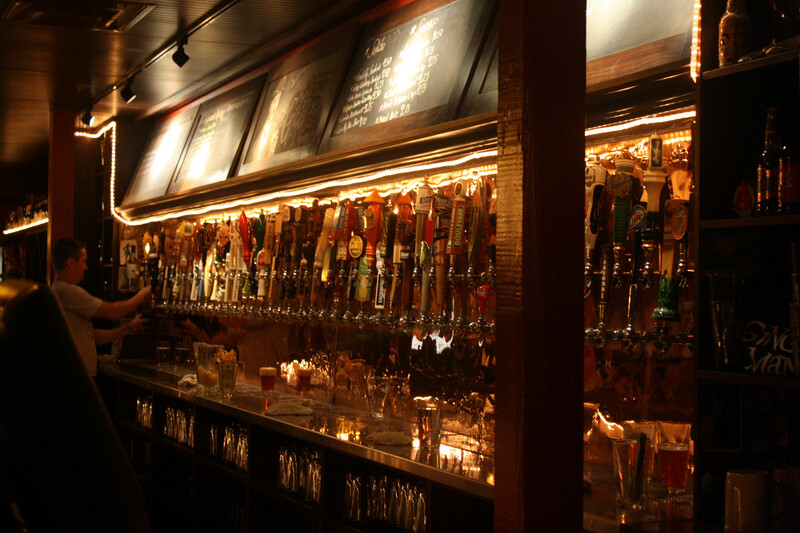 I recommend it to any beer fans because there were at least 100 beers on tap. I ended my jam-packed day EXHAUSTED. 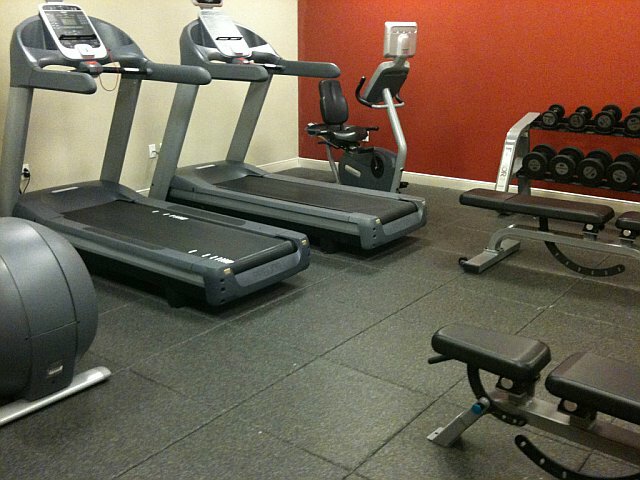 Tuesday morning I got up early and worked out in the hotel gym. 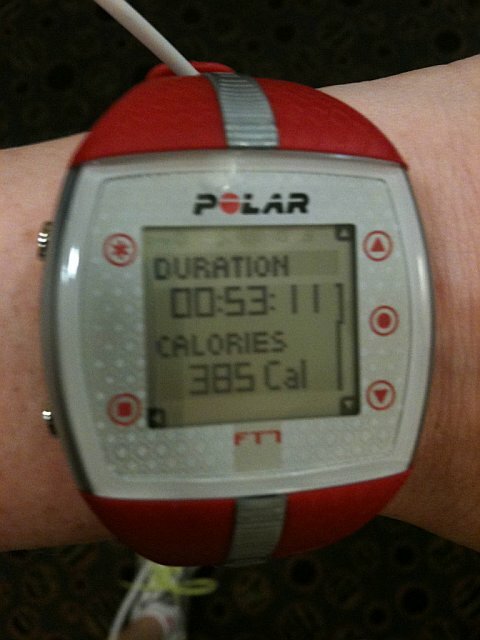 It was empty at 7:20 (which was nice) so I used the elliptical. It wasn’t the best but it was better than nothing! 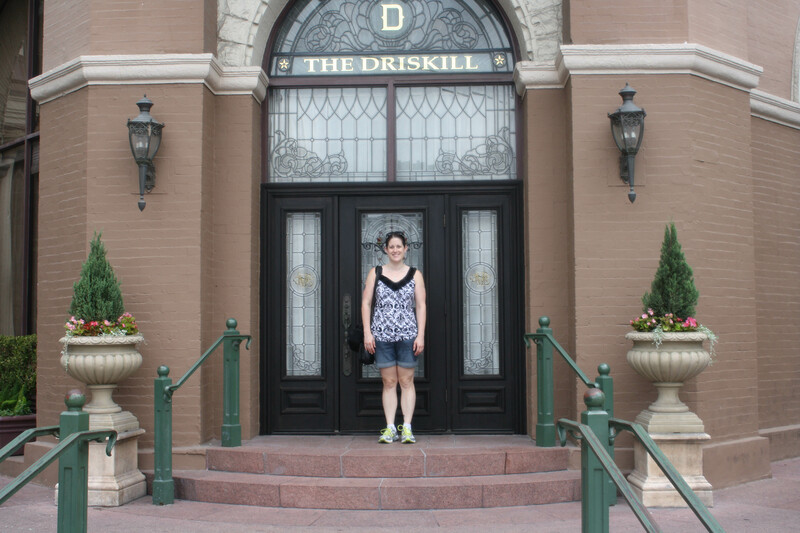 We checked out and went downtown to The Driskill for breakfast before we left. We sat outside on the patio. It was so humid that my glasses and camera lens fogged up as soon as we stepped outside. It felt like we were walking in moisture. Breakfast in the Driskill café is good and worth a visit. We both ordered the Migas. It came with refried beans and a VERY spicy chipotle salsa. 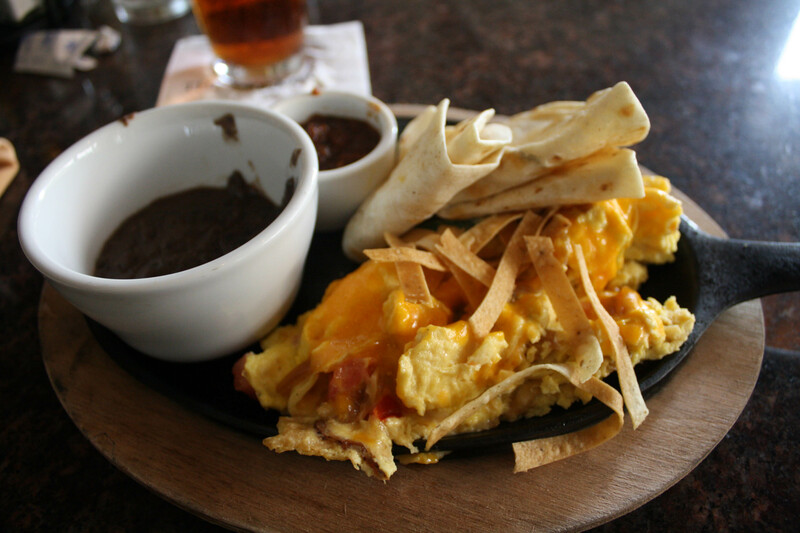 The 2 scrambled eggs had caramelized onions and VERY hot jalapenos in it. The meal was tasty and filling, even though the portion seemed small at first. 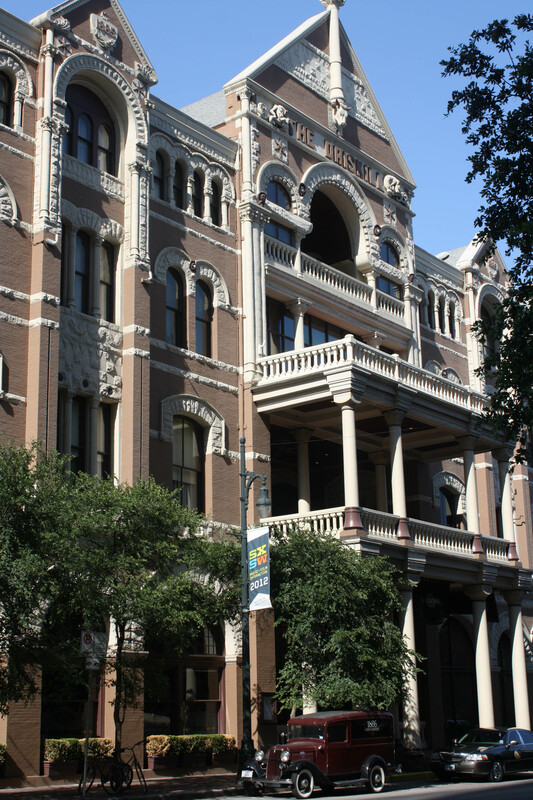 Fantastic service at the Driskill—every time we went there, in fact—and I really recommend it. It’s a classy place. We spent 5 days in Texas total and I was ready to go home after the 4th day. It was a long vacation, the longest we’ve been on together I think. 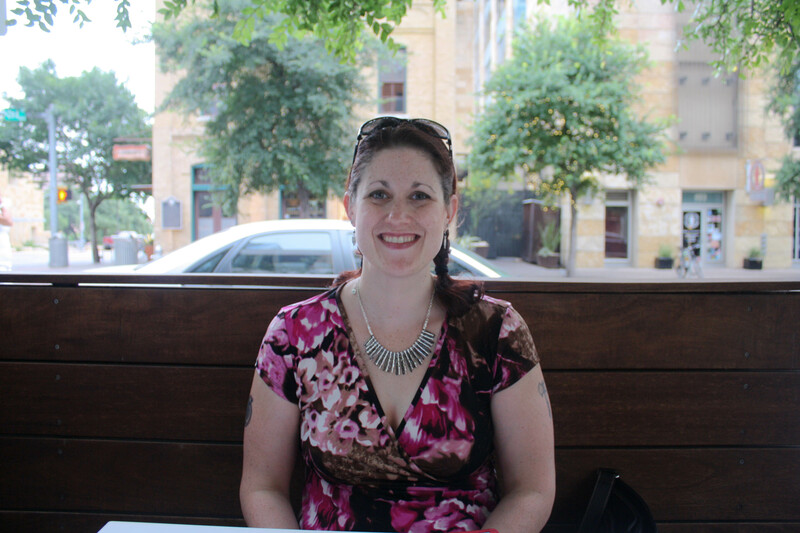 It was fun (and we only had to pay for the Austin portion so it was affordable–the benefit of staying with family!) but I missed “normal” weather, my kitties and VEGETABLES. How did I do? I indulged, definitely, but I did not go overboard. 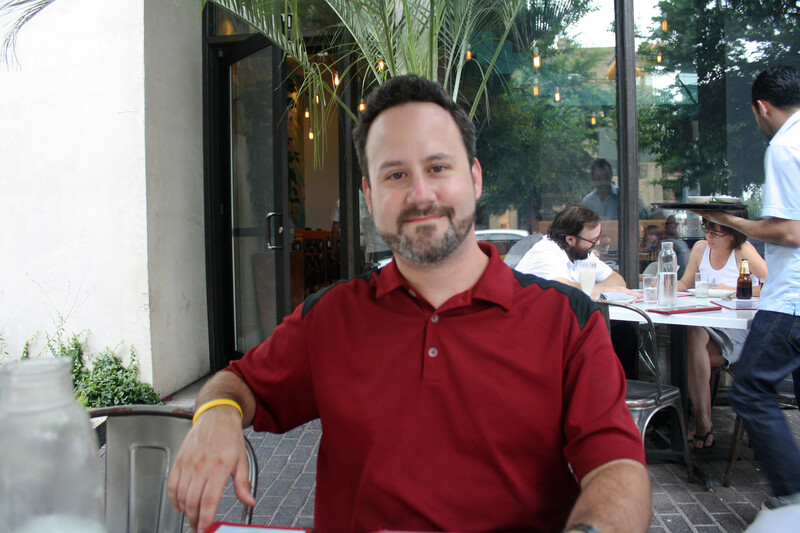 I ate smaller portions, less frequent meals, and the heat killed my appetite. But I definitely ate foods that are not normally in my diet—fried and fatty. I was so ready to go home and eat vegetables from our garden, fruit, and not-fried foods. I’m sure I gained a few pounds but will be trying to reverse that immediately back in Portland. I am happy that I was able to work out, run and swim on vacation. It helped me feel healthy while I indulged. QUESTION: What do you miss most about home while on vacation? When we decided to move (from California), we didn’t know where we were going initially, and we specifically sought out places with warm climates. I love heat and loathe the cold, along with long stretches sans sunshine. And I’m “cold” when it drops below 72. But it really is brutal hot during the (6-month-long) summer here, even for me. I view it as the equivalent to cold winters in the north: The time of year when you just kind of do mostly indoor stuff. At least during the afternoon. Although getting in the water or sitting in the shade somewhere with a cold drink works pretty well, too. To answer your question, when I’m on vacation I miss my dogs, and just being a slob around my house, and also VEGETABLES. Was it work that brought you to Texas or the heat and sunshine? I cannot imagine leaving California. California sounds like the place to move TO. But, I’ve spent my whole life in the Northwest. I am over the rain and gray and cold. I run cold (I’m always cold) but that Austin heat was almost too much for me to bear! I miss my kitties a lot. Wish they could travel! It’s hard to sleep on vacation without them. The overcrowdedness and cost of living drove us FROM California. I loved it there, but after a decade was burned out and restless. It’s a really popular story here, actually. Californians are always flocking somewhere, it seems. I miss the weather (it was very hot where we lived, but less humid), the great geography of the west coast, and San Francisco foods. There are other things I love about Austin and it all kind of balances out. We can live much more comfortably here. The people are fantastic. There’s lots of nerd/tech/film/music action that we get into. Mostly, I like new places and am always willing to move. I was a military brat. I can see the appeal of Austin. Michael and I both agreed that if we had to move to Texas, Austin would be the place to be. It felt the most comfortable, the most similar to the Northwest. It was like a combination of Seattle and Portland with sunshine. It was a really good trip and I’m glad we had the opportunity to go. It was nice to celebrate Michael’s sister’s wedding with the whole family and it was nice they included me. Austin was great, too! I ALWAYS miss my kitties! Sounds like a great vacation! I believe your body does acclimate to the heat (I’m from Florida) but even so, we avoid exertion in the heat of the day when it is above 95 or so because it can get dangerous. That’s why so many people in the south have a swimming pool in their yard or go swimming a lot! I bet I would get used to the heat pretty quickly. I definitely like the sunshine better.